Travel in the small Japanese tea room?! The basic size of the tea room is just 4 and half tatami mats（≒8.208㎡). Even in the small room, we can travel and imagine the history from north to south in Japan if we try to see tea utensils one by one. It’s like traveling Japan. It is made by only hands, not using electric wheels. Senno Rikyu, the founder of tea ceremony asked a tile craft man called Chojiro to create a tea bowl in the end of 16th century. It is the origin of Raku. 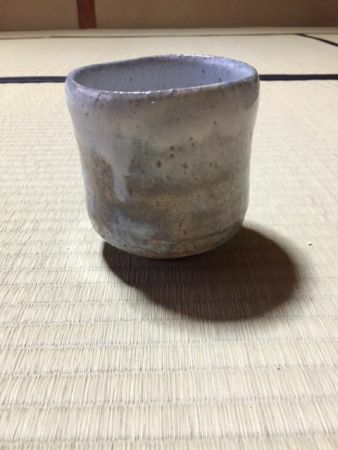 Raku is the most precious tea bowl for tea ceremony. 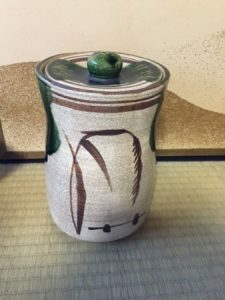 Although many artists are making raku tea bowls, the most famous family is Raku Kichizaemon, the descendants of Chojiro. Now, we have 15th craft man. 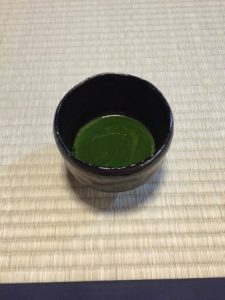 Tea masters often say “The first raku, the second hagi, and the third karatsu”. The pottery opened in 1604 by brothers from Korea. The typical color of Hagi is white or pale pink. Its color changes by years if we use them longer. It is called “7 turns of Hagi”. 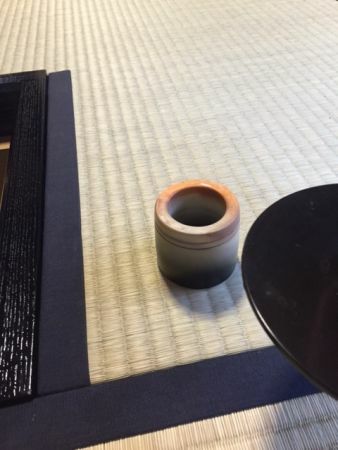 The picture is the deep tea bowl only for winter to keep powdered green tea warmer. 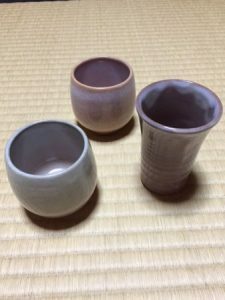 This is the ordinary cups I bought in Hagi when I had visited there for a school trip 15years ago. They are also beautiful. It is so popular among tea masters that it is often said “third, Karatsu”. Its typical design is described by the glaze of irons. It’s not bright, but what we call “primitive beauty”. The origin is from Korean craft men forced to come to Japan by Toyotomi Hideyoshi. This is the vase of Bizen, which are made without dusting glaze. Its primitive surface is beautiful. The origin is the ancient pottery called “sueki”. My acquaintance gave me this vase as the cerebration of the opening of Tea Ceremony Koto. 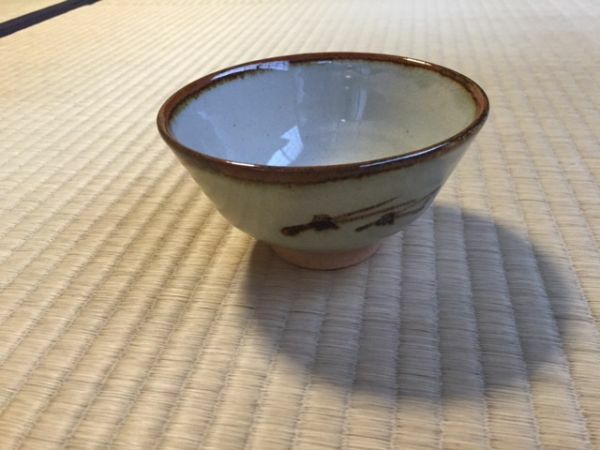 It is one of the potteries made in Mino(Gifu). Oribe is the name of the person “Furuta Oribe”. He was a samurai as well as the tea master. Curved shape, green color and geometric designs are typical of Oribe. I use this thin fresh water container only for the way of tea in October. 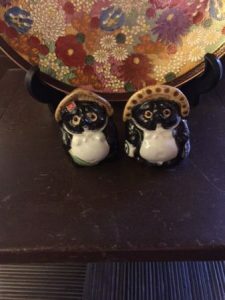 Although Shigaraki is famous with raccoon dos nowadays, it has been famous for tea utensils since Muromachi period(1392-1573). Potters in Kyoto also uses the clay in Shiga prefecture. 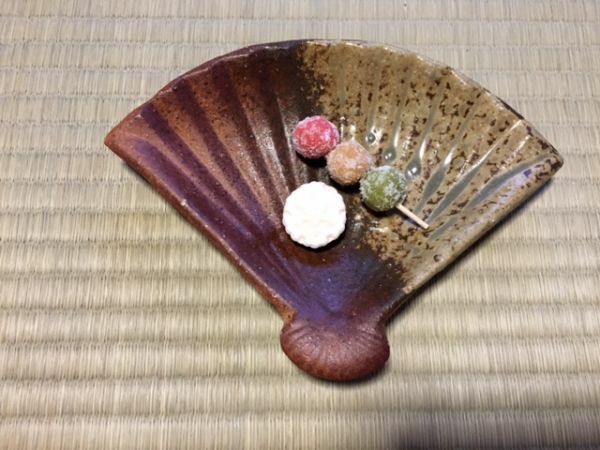 These are the plates for sweets. In case I have only one guest, I use this kind of plate to serve sweets. It’s not very famous pottery as the tea utensils, but my senior gave me as the souvenir of his trip to Ako Hyogo. I think it’s very interesting to find rare pottery when I go to country side in Japan. Every pottery spots are unique and worth looking. Not only potteries but also we have lacquer in a tea room. 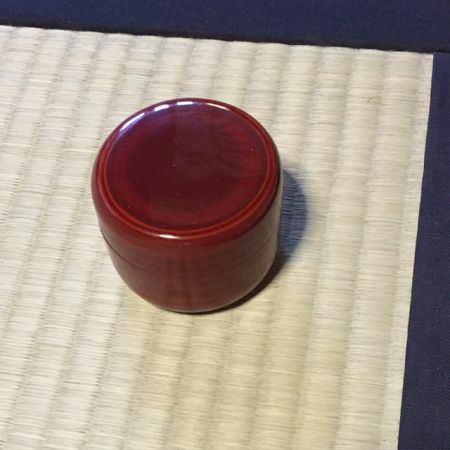 It’s a tea container. Of course we have plastic tea container for the practice, but it’s real one. The delicate color and quality, surface are different, so worth looking at. I’m trying to prepare varieties of utensils from north and south in Japan for you to enjoy Japanese designs. Since we need to take care of the precious tea utensils, tea houses for tourists or beginners tend to use almost all plain tea bowls or tea utensils without thinking of four seasons in Japan. But don’t you think it’s too far from the authentic tea ceremony and less enjoyable? 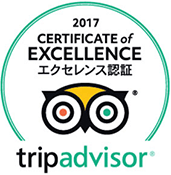 I’d like to share varieties of design in Japan and four seasons with foreign guests as well as Japanese guests in Tea Ceremony Koto.